Nicollet Lanterns, a series of magical illuminated sculptures by Blessing Hancock, was suspended between 6th and 8th Streets last week. 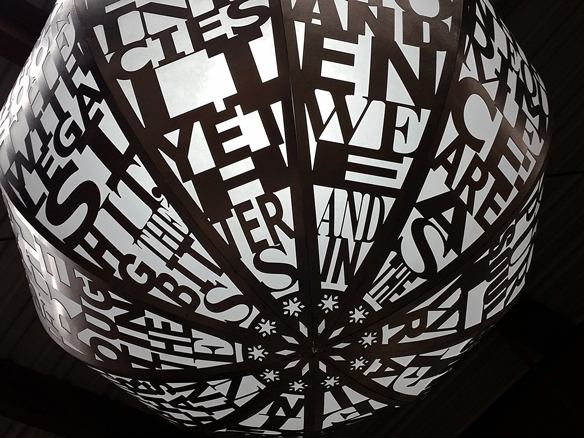 Twelve spherical forms measuring four-feet in diameter, each has a unique design featuring the text of a poem by a Minneapolis writer. Moheb Soliman, Junauda Petrus, R. Vincent Moniz, Jr. (Nu’Eta) and Sagirah Shahid have each created three approximately 100-word poems especially for the lanterns. The poems celebrate each poet’s perspective, viewpoint and voice and speak to the city’s diversity. Like an unwrapped gift, one of the Nicollet Lanterns awaits assembly and installation on the Mall. Lines of poetry run horizontally around the globes and present an ever-changing visual experience. When viewed from different angles, new associations are created between words, and new meanings revealed. Here are four original poems, in full; one by each artist, shown with the corresponding lantern. Moonlit childbirths with shackled feet. Back. whip. lash. in you. Where they do dat at? We transcended the science. Long time. You are safe. Universal. Limitless. Sacred. Can you hear our youth? fires boil ten thousand lakes. of solidarity for our future’s present. an answer to questions you wanted to find people you refuse to see. But what’s the plight of a slave if not to make due? Dua for the unborn and bulletless. and potted roots yanked free? my life is fear and muffled survivals. Eight other poems may be read here along with profiles of writers Junauda Petrus, Sagirah Shahid and Moheb Soliman. A profile of R. Vincent Moniz, Jr. (Nu’Eta) is coming soon. Nicollet Lanterns Coming this Week! Blessing Hancock’s Nicollet Lanterns at the studio of Gizmo Art Production in San Francisco, CA during the final stages of fabrication, assembly and testing. Read about the design here and local writers Moheb Soliman, Sagirah Shahid, Junauda Petrus and R. Vincent Moniz, Jr. (Nu’Eta) whose poems are featured. Check back soon for installation photos. To learn more about the fabricator click Gizmo Art Production.